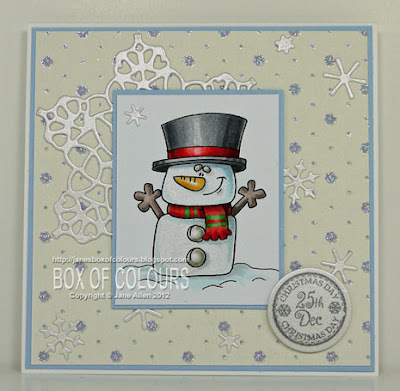 If you would like to join in with the July Challenge and earn yourself a free digi hop on over to Dustin's Blog where you will find all the details and where to post your entries. Even your snowman is a little square LOL! He's too cute, and the snowflake bits are a perfect touch. hehe love the square snowman Jane! suits the theme perfectly hehe :) Always great colouring and shading too! That's one cute snowman! Fab colouring too. Hello sweet Jane! Your colouring in this is stunning - the depth is stunning!! I love this cute cute card! Thanks for your nice comment Jane... I still want to be able to color like you when I grow up... love your marshmallow snowman! Brilliant,I love it and your colouring is fantastic!!! A lovely card Jane, gorgeous snowflakes in the background. So gorgeous Jane, love the effect of this Ranger pearl!